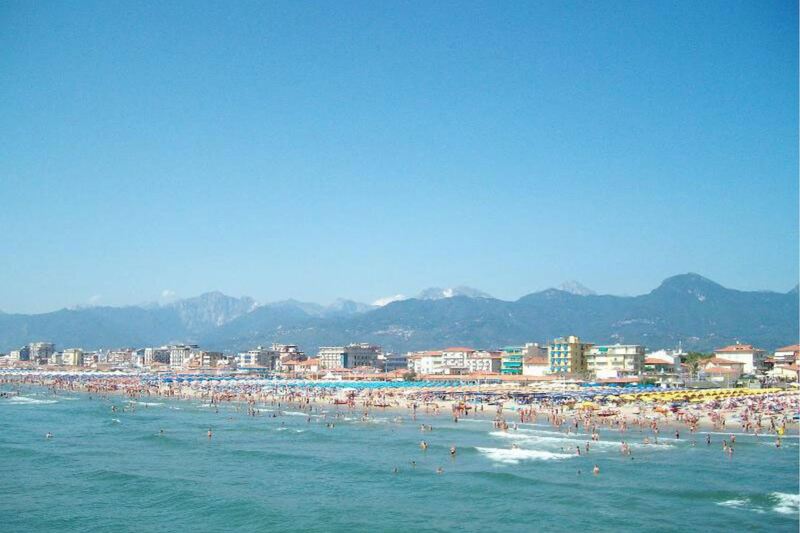 Like other resort and touristic areas of Versilia, Lido di Camaiore began to develop in the early 20th century, when it was chosen as a holiday venue by industrial families, noble and important personalities like D'Annunzio, for its fine golden sand, the vast beach and the shallow depth of the blue sea. The town is characterized by an elegant promenade along which we find the most of the bathhouses, shops, restaurants, bars and cafes, where to stop for a drink, sit back and enjoy the spectacle of the coast and the Apuan Alps. For sports persons a long bike path that leads from Viareggio to Forte dei Marmi. The hilly hinterland allows to make walks, bike or horseback trips, and the Apuan Alps, reachable in about 20 minutes, offer a wide choice of routes. The town is also situated in an ideal position to discover the picturesque Tuscan countryside, and is a great starting point to the main art cities and tourist centers of Tuscany and Liguria. First floor apartment for 4 persons with air conditioning, just 100 meters from the sea in Lido di Camaiore. The cities of Pisa and Lucca are only 30 km away.